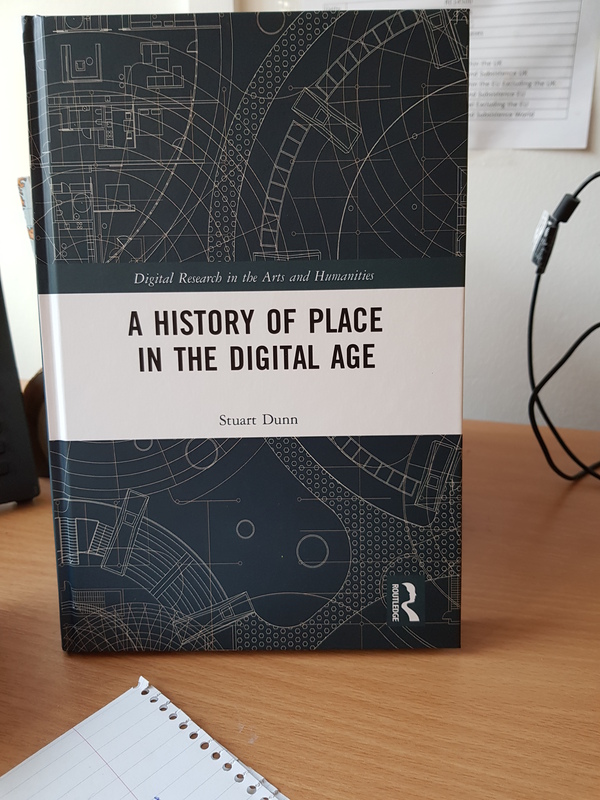 This is the first of a series of posts to follow the recent publication of my book, A History of Place in the Digital Age. My aim with these is to look at various topics on the theme of what it means to write a book in the Digital Humanities (DH) as a means of reflecting on what I got out of the process as (I guess) a “Digital Humanist”, partly to capture such reflections for posterity (whether or not posterity has any interest in them), and also in the hope that they might be of some sort of value to others considering such a course. Here, I look at the links between writing a book at teaching, in both the undergraduate and postgraduate taught classrooms. A prosaic problem is, of course, accessibility. Even the most committed student would balk at the cover price of a History of Place, and inevitably it takes time for an institutional library to place orders. It is therefore worth exploring in detail what one can and cannot do to make your work available under the terms of one’s contract; and, where possible, expediting library acquisitions by (for example) encouraging purchase of the e-edition. I don’t think I have any searing insights to offer on this subject, rather I see it as part of a much broader and more complex set of issues on Open Access in Higher Education which, I am sure, others are far more qualified to comment on than me. It’s a tenet of major research universities such as my own, that our teaching should strive to be “research led” (see e.g. Schapper, J. and Mayson, S.E., 2010. Research‐led teaching: Moving from a fractured engagement to a marriage of convenience. Higher Education Research & Development, 29(6), pp.641-651). Most, I guess, would interpret this as meaning that the content delivered in the classroom is sourced from one’s own original research, in the context of one’s Department’s research profile an strands, conveyed via various pedagogical tools and techniques. Most of the latter are based on conventional scholarly publications, notably journals and, of course books. In the future, I would like to consider particularly the implications of writing a book – and thus complicity, for better or for worse, in that environment – for student assessment, and the kind of culture the act of authorship encourages. In this, one needs to bear in mind that the traditional essay is perhaps not best suited to the delivery of all kinds of DH content. To transcend this truth (which I think most DHers would accept) I plan to use some of the cases discussed in my book – for example mapping references to Cypriot places in texts, (the subject of much of Chapter 7) – to encourage students to test and challenge observations I discuss on the construction of imperial identities, for example by using practically the Heritage Gazetteer of Cyprus. Ideally, I would like to accompany this with screencast videos to accompany the institutional lecture capture (the desirability and ethics of this are a story for another day); something I have already started to do to assist students with the Quantum GIS exercise they learn. The text of my book is structured around a postgraduate module I have taught for three years now, Maps Apps and the GeoWeb: An Introduction to the Spatial Humanities. I think it is fair to say that there has been a great deal of cross-fertilization between the two activities, certainly at the design stage. The chapter structure of the book partly, but not entirely, reflects the weekly lecture programme for Maps and Apps, a conscious decision I made when drawing up the book proposal, figuring that there could be economies of scale in terms of the effort involved in both tasks. Writing chapters which correspond to classes was a great opportunity – and impetus – to update my own knowledge and scope of understanding of those topics, and numerous new insights have found their way in to the lectures this year as a result. This has also given me a richer context to include, where appropriate, examples from contemporary life, something I feel greatly helps students engage with complex concepts, relating them to their own experience. For example, my class on neogeography, delivered towards the end of the Semester, was updated this year to include a discussion of commercial appropriation of passive neogeographic material by transport service companies, something which I explore at a theoretical level in Chapter 5 in A History of Place; but which (I think) also points students towards much broader contemporary issues which they see in the news, such as the appropriation of user data by platforms such as Facebook. Teaching this class, I have found that students react creatively and imaginatively to a task where they are asked to find actual instances, based on their own local knowledge and spatial experience, of omissions of features in OpenStreetMap, of the kind described by Monica Stephens in her 2013 paper Gender and the GeoWeb: divisions in the production of user-generated cartographic data; an important text both in this class’s reading list and in Chapter 5. [A] network of “thinking centres”, connected to one another by wide-band communication lines and to individual users by leased-wire services. In such a system, the speed of the computers would be balanced, and the cost of the gigantic memories and the sophisticated programs would be divided by the number of users. In my view, this expresses a “de-spatialization” of human knowledge that directly foresees the kind of interactions and data transactions now familiar to users of OpenStreetMap, Google Maps, and indeed any other kind of geo platform. This seems to me to be fundamental to the epistemology of the spatial humanities, helping to explain the emergence of the GeoWeb in the broader context of the information age. I therefore have to admit – with a little trepidation – that as well as my teaching being research-led, my research is, to an extent, teaching-led. This is of course before I factor in discussions with the students themselves, in tutorials, seminars and questions after lectures (which do happen occasionally); and more than once my mind has been changed on a particular issue by an excellent student paper. Of course, it depends on what kind of book you’re writing. A History of Place is quite a broad-brush consideration of the history and impact of GIS, and related technologies on the humanities, which is analogous to the module design and learning outcomes of Maps and Apps. It is therefore logical to expect a rough, although not necessarily comprehensive (see above) correlation between the class topics and chapters. It would of course be different in the case of a highly specialized book dealing with a particular topic in depth. But even then, I feel sure there would be similar crossovers even in such cases. So, to summarize: Obviously we must aim to pass on our original insights as scholars to students. However, it is also very well worth considering, in as detached a manner as possible, what new insights your teaching might contribute to your book. This, in turn, will help you to strengthen and improve our teaching, and the curricula of your courses – especially when (as many Digital Humanists do) you teach courses across disparate subject areas. A careful mapping of course reading lists to your own bibliography can be very helpful for the same reason. There’s an interesting tension between writing a book with a title like A History of Place in the Digital Age, while in the process engaging in a massacre of trees to produce a paper book. Anyway, it’s now out, and available from my wonderful publishers at Routledge. I’m going to try to blog here a little more in (the rest of) 2019, especially offering some ideas on the spatiality of scholarly communication. A central premise of the book is that communication through different media has always both fractured and shaped our ideas of place, and that we can trace this back in to the distant prehistories of the Internet, to the origins of print media, and perhaps even further. This surely applies to the communication and consumption of scholarly ideas, where digital media are rethinking what it even means to have scholarly ideas. One thinks of the work of scholars such as the Classicist Sarah E. Bond, whose ground-breaking work on scholarly outreach and public communication puts Classical ideas into contemporary social, cultural and political contexts, thus (surely) inviting audiences, both inside and outside the academy, to revisit the substance as well as the communication of those ideas. Linking to my own more recent work in digital art history, one can begin to see parallels with recent arguments which suggest that it is not so much the distinction between “digitized” versus “digital” art history (i.e. the use of digital imagery and resources versus the use of computational analysis to understand individual works of art) which is important, as much as what the role of art becomes in a society in which the Internet is ubiquitously and fundamentally integrated. And there is still some room at the launch on 9th May.